Sandy and Kate got us some great Christmas presents, and while we have yet to use one (the great cookbook), the other (a stainless all-clad pan) inspired us to re-think our blueberry steak recipe. When we originally cooked this, we used a cast iron skillet to sear and cook the steaks and then made the sauce in a separate sauce pan. Cooking with stainless is great because you can sear things with it and make pan sauces just like you would a cast iron, but it’s easier clean-up and easier to see what you’re doing. So! 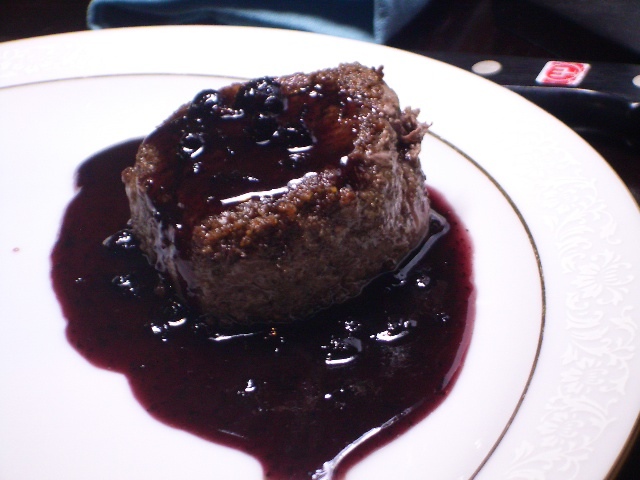 Taking advantage of both of these properties, we decided to use triple sec to de-glaze the pan after cooking the steaks and then added blueberry sauce to make a blueberry pan sauce for our steaks. Delicious! If you still don’t believe us about the merits of blueberry steak, it’s gotten to the point where we just feel sorry for you and for your tastebuds.